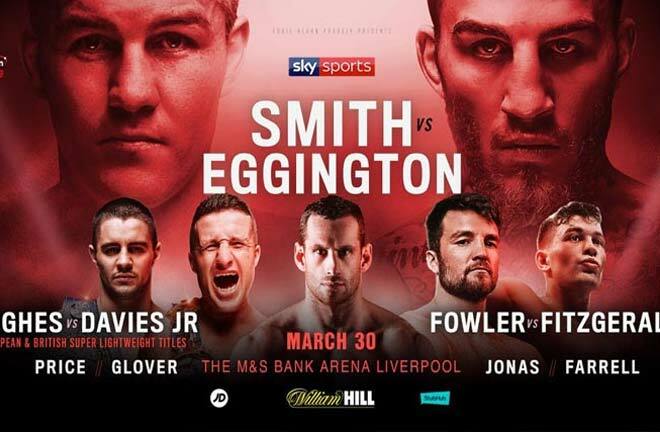 In a refreshing change, the undercard of this weekends’ Matchroom card at the M&S Arena in Liverpool is pretty decent. Leading the preliminaries is an intriguing clash for British and European Gold at Super Lightweight. Home fighter, and British Champion, Robbie Davies Junior (17-1, KO12) puts his Lonsdale belt on the line against the remarkable European Champion, Joe Hughes (17-3-1, KO7). Hughes was born with Erbs Palsy, a rare condition which is a paralysis of the arm, and has left Hughes with one arm shorter than the other. It hasn’t stopped the Malmesbury man from succeeding though, winning area and English Titles. He unsuccessfully challenged for the British Title in April 2017, managing a split draw with Tyrone Nurse in Leicester. He returned to the same Arena eight months later, and lost a decision to Anthony Yigit for the European belt. But in November last year, he upset Andrea Scarpa in his own backyard in Florence, Italy, to lift the European strap that he will defend in Liverpool. Hughes boxed supremely, and was always in control of the contest, and was deservedly adjudged the winner. Davies was forced to rebuild after being stunned by the unfancied Pole, Michal Syrowatka at Wembley Arena, stopped in the twelfth and final round. In fairness to Davies, he jumped right back on the horse, and an immediate rematch eight months later saw Robbie turn the tables, dropping Syrowatka three times before stopping him with thirty seconds remaining of the fight. After exercising that demon, Davies was last seen in October last year, winning the British and Commonwealth Titles with a dominant point win over Glenn Foot in Newcastle. Prediction: Although Davies will start as a warm favourite in this one, Hughes has a great engine, and his work rate is second to none. This could be a real tight affair, but I lean towards Davies’ cleaner boxing skills, and ability to box and move, to give him the win by a couple of rounds. 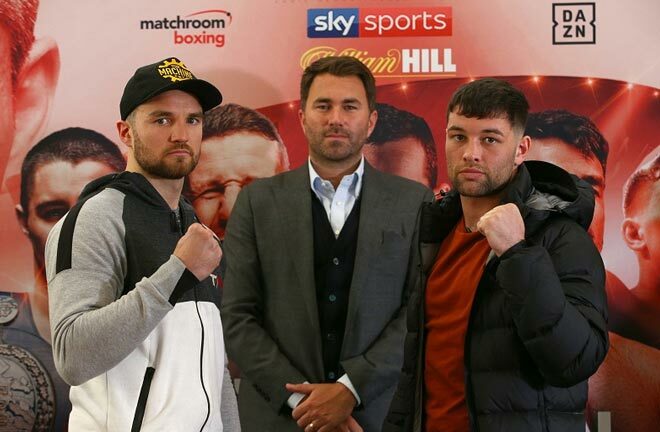 A real grudge match takes place at Super Welterweight, as the Social Media war of words comes to an end between ex amateur colleagues, Anthony Fowler (9-0, KO8) and Scott Fitzgerald (12-0, KO9). The WBA International Title over ten rounds is also at stake. The pair have been calling each other out on various platforms for quite some time, and it’s good to see the two going at it so early on in their careers. 2014 Commonwealth Gold Medallist Fowler, has grown into the professional code, and his last few performances have seen increasing improvement. The Scouser had five outings in 2018, all won via knockout. His last appearance lasted just over half a round, where he blasted out Jose Carlos Paz in December in Sheffield. Fitzgerald has been slightly the opposite, with injury and a dip in performance levels. He was given all he could handle by Craig Morris in September 2018, and could have been arguably behind on the cards before pulling out a last minute stoppage win against Craig Morris. “Fitzy” insisted on a tune up before meeting Fowler, and he easily dealt with Radoslav Mitev in London last month, knocking him out in two. Prediction: I think Fowler is coming into his own, and their could be some big domestic fights on the horizon for him in 2019. He first must keep a cool head against a man who he has clear dislike for. It should be a blistering start to the contest, with Fitzgerald looking to rough Fowler up early on. Once he weathers the storm, I think Fowler will invest to the body, and feel he will stop Fitzgerald in the later stages of the fight. 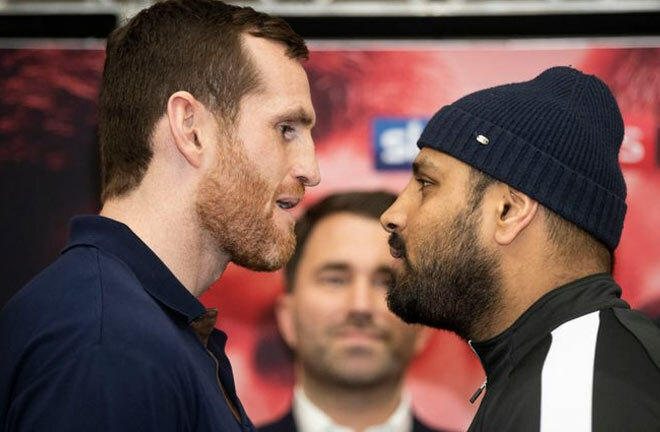 David Price (23-6, KO19), still at the point of no return, puts his career on the line again over ten rounds, against unbeaten, but untested Brummie, Kash Ali (15-0, KO7). Ali will surely see this fight as a potential ticket to the big time, if he can take Price’s scalp. A loss for Price will finally see the end of his career. Ali has not fought any where close to the level of his opponent, with his best win arguably a two round stoppage of David Howe to win the Central Area Title in March 2018. He has fought three times since, against opponents with a combined 4-10 record. He knocked out the 2-2 Colin “Butch” Goldhawk last month inside a round. Price has sadly failed to fulfil his potential after an Olympic Bronze Medal in 2008, and a fifteen-fight winning streak to start his career. His confidence hasn’t been the same since back to back stoppage losses to Tony Thompson in 2013. He has since been brutally knocked out by Erkan Teper and Christian Hammer and was agonisingly close to knocking out Alexander Povetkin in Cardiff last year, before being savagely knocked out himself in five rounds. He was forced to pull out after four rounds against unbeaten Russian, Sergey Kuzmin at Wembley Stadium last September due to a torn bicep, leaving his career in tatters. He is having one last shot at glory, and began with a fairly premature fourth round stoppage win against Tom Little in December. Prediction: Defeat for the likeable Price is unthinkable, but Ali will be of the belief that one big shot landing clean on Price’s chin will signal lights out. Price carries serious knockout power, and should be levels above his opponent. If he can work off his booming jab, and put together his rock solid one-two combinations, I fancy him to take out Ali within three rounds. The Commonwealth Super Lightweight Title is on the line on the bill as recently crowned Champion, Phillip Bowes (19-3, KO3) defends the belt he won just eight weeks ago, when he meets local lad Tom Farrell (16-1, KO5). Bowes stopped Benson Nyilawila in two rounds at the York Hall at the start of February, and he has only lost in good company. Back to back defeats to Joe Hughes and Johnny Coyle in 2014-15 and a tight points loss to Glenn Foot in May 2017 have been his only setbacks. Farrell has one loss on the slate, down five times in six rounds in a September 2017 loss to O’Hara Davies. He has rebuilt with three low key wins since. Prediction: I fancy the durable Bowes to retain via decision, as both men aren’t in possession of knockout power. There are also outings for former IBF Bantamweight Champion, Paul Butler (27-2, KO14), who meets Fadhili Majiha over six rounds at Super Bantam, and Natasha Jonas (6-1, KO5), who comes back from her first career loss against Feriche Mashauri over six, two minute rounds at Lightweight.